Great as computers are in communication, they are seriously flawed in one area: colour fidelity. How do you know, for example, what kind of yellowish green is someshirt 1201 exactly? The truth is, you don't know. Not exactly. Even if a photo of this shirt looks right on our screen, there is no guarantee it will be the same on your screen. So much depends factors like the type of display, the program you are using, the lighting conditions in your room, the viewing angle and so on. Fortunately, there is something like a universal language of colour: the Pantone color system. 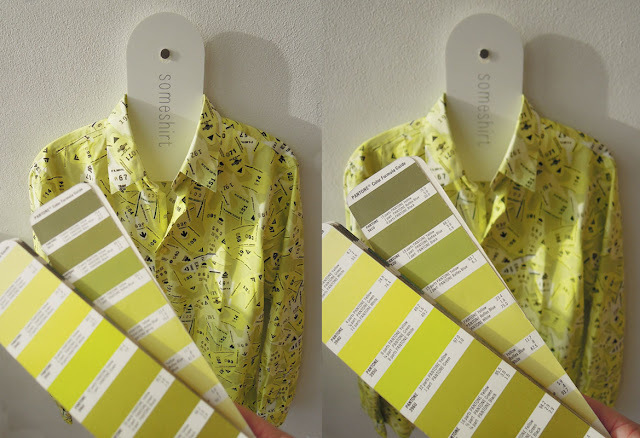 So if you are in the possession of a Pantone color selector, look at the pages that show the colours PMS 393U-399U and 581U-587U, and you will have a pretty good idea of the range of greens in someshirt 1201!